James E. Foster, 85 years old, died at 1 o’clock Thursday afternoon in Warren, Pa. Surviving are two sons, James of Indianapolis and Glenn of Cheyenne, Wyo: one daughter, Mrs. Gladys Yegerlehner of Kentland; two sister, Mrs. Cora Miller and Terre Haute and Mrs. Lizzie Johnson of Largo, Fla., and one brother, R. W. Foster of Sharpsville. The body will be brought to Cross Funeral Home where friends may call after noon Sunday and where services will be at 10 o’clock Monday morning. 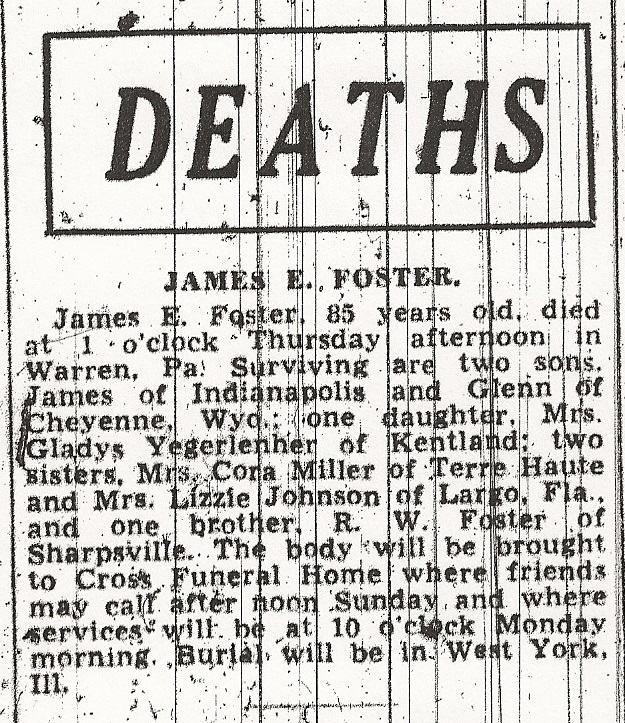 Burial will be in West York, Ill.
James Edward Foster was born 3 May 1869 in York Township, Clay County, Illinois. He was the eldest surviving son of James B. and Lydia (Dicks) Foster. James and Lydia were the parents of thirteen children of whom only five survived to adulthood. James grew up on his parents’ farm, and after the death of his father in 1887 (when James was 18), he worked as a farm hand. Later he worked as a traveling salesman and a clerk. At the end of his life, he appears to have worked as a gardener. On 29 February 1896, James married Emma Lawhead in Hutsonville, Illinois. They were the parents of five known children: Lydia Allie, Glenn E., Forrest, James L. and Gladys R. Of the marriage little is known. 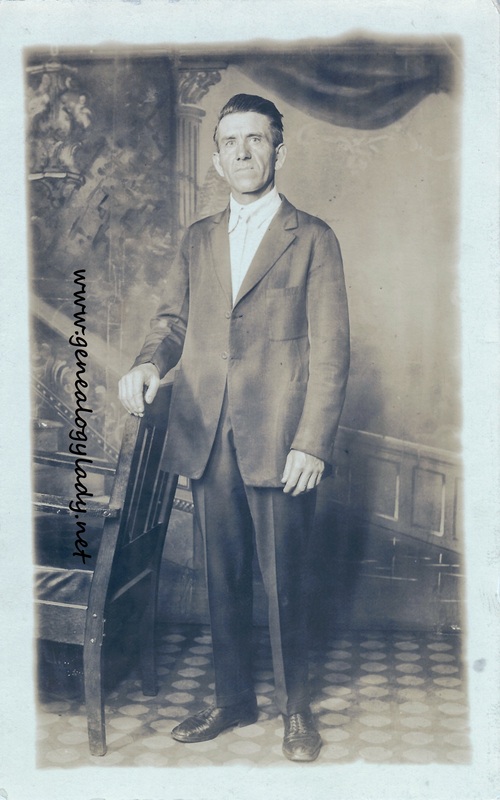 According to Gladys, her father was an alcoholic. Eventually Emma got tired of James’ behavior and kicked him out. Whether they were officially divorced or not is unknown. This entry was posted in Genealogy, Sunday's Obituary and tagged Cora (Foster) Miller, Emma (Lawhead) Foster, Forrest Foster, genealogy, Glenn E. Foster, James Benjamin Foster, James E. Foster, Lizzie (Foster) Johnson, Lydia Allie (Foster) McCammon, Lydia Catherine (Dicks) Foster, Rolland W. Foster, Sunday's Obituary on November 3, 2013 by Deborah Sweeney. This entry was posted in Foster, Genealogy, Lawhead, Rotary Club, World War II, World War II Letters, Yegerlehner and tagged Cora (Foster) Miller, Emily Hogue, Emma (Lawhead) Foster, Forrest Foster, Gladys R. (Foster) Yegerlehner, Glenn E. Foster, James E. Foster, James Henry Lawhead, James L. Foster, Jasper Lawhead, Jesse Roy Lawhead, Jessie (MacDonald) Schiele, John F. Yegerlehner, Juanita McCammon, Lovina (Schiele) Yegerlehner, Lydia Allie (Foster) McCammon, Margaret A. (Lawhead) Cox, Margaret Allie (Rea) Lawhead, Minerva (Lawhead) (Riggs) Metcalf, Roscoe S. Yegerlehner, Ruth E. (Yegerlehner) Mutchler, Silvester Schiele on December 13, 2012 by Deborah Sweeney.